Do you have an older RV and find yourself in the market for an RV macerator pump? Are you confused on how to find the best RV macerator pump for your RV? Well, you’re in luck because this guide here will do all the research for you. And in doing so, we’ll help you avoid those awful situations where you’re given a spot too far away from the sewer, and you can’t dump your RV’s waste. With the products in this article, this scenario will never happen again. In fact, it’ll be the last thing on your mind. You’ll never have to worry about not having a way to dump waste ever again. With the information in this article, you’ll always have a useful backup to help during these times of crisis. Therefore, we’ll go over topics like what factors you should consider, how to use an RV macerator pump, what is an RV macerator pump, etc. And with this all this new knowledge, you shouldn’t have any trouble picking out the right macerator pump for your RV. 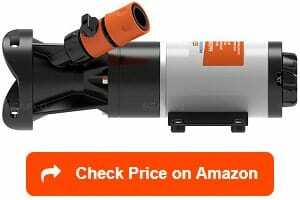 To familiarize you with the RV macerator pump market, we thought that providing you with detailed product reviews would be a good starting off point. It’ll give you a sense of what’s out there before we go over the more extensive details of these products. Our first portable macerator pump, the Flojet Portable Macerator Pump, leads the product review section off in a positive way. See, this RV macerator pump is easily one the best in the business for a multitude of reasons. For one, it has a handheld on/off switch that offers peak convenience. I mean, I want to stay far away from my RV’s waste as long as humanly possible. With this handheld on/off switch, proximity to the waste doesn’t become a significant issue. Along the same convenient lines, it offers 30-second dry run protection just in case I forget to turn it off after the waste stops flowing from the waste outlet. And knowing me, this scenario will definitely happen once or twice. Therefore, with this feature and my “clear elbow,” I should avoid this predictable situation from being a consistent nuisance in my life. After all, I want to avoid any circumstance where my pump might burn out, and these two features give me some wiggle room. And it comes at a reasonable price that doesn’t hit the bank account too hard. In fact, it falls right below the 200 dollar average for an RV macerator pump, which is perfect given the number of times I plan on using the pump I choose. However, there was concern regarding the customer service. See, there were multiple reports of issues in this area. This lack of accountability from a manufacturer is disappointing to see. And it makes me see this product in a different light. With this in mind, I’d think I’d have to pass on buying this product. If I’m going to pay this amount of money for a consumer item, I expect a certain level of customer service. Some customers report customer service issues. The SHURFLO macerator pump is our first permanent model, and it uplifts its manufacturer’s reputation by being a top-notch product. In result, there’s no reason any RV owner shouldn’t consider this fantastic pump. For example, it has a dual blade to ensure there’s no issue with pumping. After all, you don’t want a product like this one getting backed up with waste. You want a macerator pump that does its job well. And with this product’s dual blade system, there’s nothing to worry about regarding its abilities. I mean, there’s little to no customer reviews complaining about this RV macerator pump’s performance in this regard. Besides performing its job at high standards, it also has run dry capabilities, which with help cover for my negligence. As mentioned before, I’m not the most aware person; so, I’d like a macerator pump that will help prevent my forgetfulness from affecting the product. Although if my forgetfulness does end up breaking the pump, the price isn’t that extensive, so, I shouldn’t have any issues replacing it. Honestly, for this pump’s quality, the price is a steal. To further this sense of this product being a bargain, it also has a 1-year warranty, which conveys a feeling that the manufacturer believes in their product. If you’ve read any of my other buying guides, you probably know how much I value the presence of a warranty. Regardless of the features mentioned above, this product isn’t flawless; multiple customers have report longevity concerns. Some didn’t even last three months. However, I’d expected these concerns to exist at this price. But given my want for a portable RV macerator pump, I, obviously, don’t think this product would be a good fit. I could see; however, this being a good fit for someone looking to go RVing for a short-term trip. 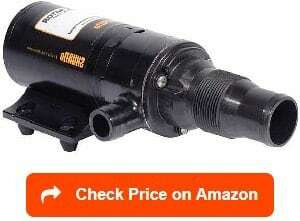 The Amarine-made Macerator Pump is another fantastic product on our list with its almost unbeatable price. But the great thing is that is doesn’t suffer in performance given its relatively low price. 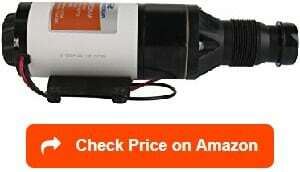 See, this RV macerator pump ensures the motor never gets too hot by having thermal protection. With this thermal protection, it makes sure your pump will be protected from being overwork by blockages. Therefore, you’ll never have to worry about your pump become ruined from overheating. Instead, this pump will shut down before this becomes an issue. Given my proclivity toward breaking things, I like a product that will shut down before that ever becomes an issue. Along the same lines, it has run-dry capabilities like the two reviewed products before it to further ensure itself against my lack of awareness. Again, I can’t overstate how overly prone I am to break or causing issues to products I own. But the final thing worth mentioning on the pros side is also this product’s best aspect; it’s portable. As someone looking for a portable model, this naturally moves this pump up farther into contention. Honestly, as someone with an older RV, I just want a portable RV macerator pump that can attach right on my waste outlet without issue. I want my journey out into several national parks to not be ruined by a constant search for dumping stations. But what does ruin this portable RV macerator pump for me is all the extra features I’d have to buy (not talking about the hose and clear elbow). See, I’m seeking a pump that comes in a full kit. In the end, it might come out cheaper to buy all extra features separately, but I just don’t want the hassle. However, you might have the time and patience for additional research. So, if you do, I’d recommend thinking more about buying this product. It does have quite a few good reviews on Amazon. If you’re looking for a permanent RV macerator pump, the Jabsco 18590 Series Macerator Pump is a great option. As you would expect from any permanent RV macerator pump, this product can be installed right under your RV. And once it’s there, I would guess that’s its four-blade system would get the job done quickly. In fact, I’ve seen a constant referencing to this macerator pump getting the job done efficiently. Given the manufacturer’s promise of this product being able to empty 30 gallons of waste in less than 3 minutes; it doesn’t come as a shock people were pleasantly surprised by its performance. Add in the inclusion of the stainless steel motor, and there shouldn’t be any durability concerns with this product. As someone who doesn’t want to keep replacing an RV macerator pump over and over again, this feature could come in handy. Even if I did have to replace this pump, the price is pretty manageable. So, if this pump ended up breaking, it won’t be the biggest deal. In fact, if I got a couple of years out of this pump, I don’t think I’d mind one bit. It also helps that the Jabsco macerator pump installation is so easy. But overall, I’m not looking for a permanent RV macerator; therefore, this product doesn’t fit my needs. Also, there was a significant issue that didn’t give me a good feeling in the pit of my stomach. See, there were several complaints about the interior bolts corroding quickly. Now, I know, I just said I wouldn’t mind replacing this pump in a couple of years. However, it wasn’t after a couple, but rather in a couple of months that these bolts started corroding. Honestly, I find that to be completely unacceptable, especially, from a company with a solid reputation like Jabsco. Can remove up to 30 gallons in 3 minutes. The SewerFlo Quick Release RV Macerator Pump is a pretty standard portable RV macerator pump that shouldn’t cause you many issues when using. In fact, its probably won’t cause you any. First off, it has a garden hose inlet that allows for easy cleaning, which is a lifesaver. Honestly, some of these pumps can be a real hassle to clean, so, a product like this could take away some of that burden. Along the same lines, this pump’s convenient by allowing you to remove it and attach within seconds. As someone who isn’t the greatest with this mechanical stuff, this ability gives me comfort. 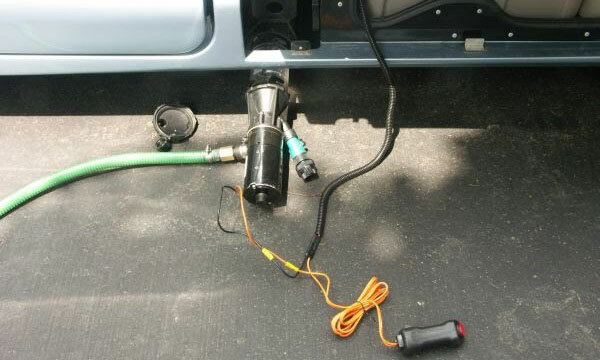 Like, I’m pretty sure I couldn’t even mess up hooking this pump up onto my RV. Plus, it can handle both the gray and black tanks, which again, speaks to its convenience. Honestly, this pump just seems to be everything I want in an RV macerator pump. Oh, did I mention that the cost doesn’t even hit the average price of an RV macerator pump? Of course, you get a bit closer once you add in the hose and the clear elbow, but even with these additional costs your still under the 200-dollar average. Besides being pretty cheap, it also has the thermal protection for the motor included ensuring the pump doesn’t get damaged because of overheating. It just doesn’t seem like manufacturer missed a step, while, crafting this product. But there was one negative little thing I found in the customer reviews; there were several people who cited durability concerns, which was a bit discouraging. However, it wasn’t discouraging enough for me to take this pump out of contention. See, even with those durability concerns, this pump’s safely on the top of my list concerning the best RV macerator pumps. You remember me saying how the last pump was my favorite? Well, I got a new favorite now with the Clean Dump Portable RV Waste Pump. And it’s mainly because it comes with a full kit while being an extremely high-quality pump. 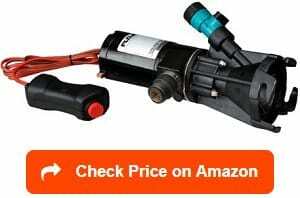 For instance, this pump has no issues doing its job for very long distances; up to 150 feet. I don’t anticipate needing that much distance, but it’s a nice option to have just in case it’s needed. 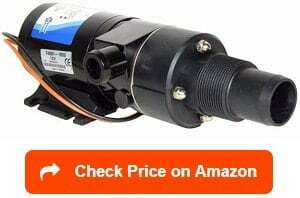 And besides being able to pump long distances, it has the stainless steel shaft, like most of the other products on this list, which will ensure nothing damages the motor. It seems Clean Dump make sure they didn’t neglect one area to enhance another. In fact, they did such a good covering all their bases; they made sure that it didn’t mess up the performance of the product. As you can see from numerous product reviews, this pump it’s in a league of its own. And as previously mentioned, it comes with everything included: a 10-foot hose, alligator clips, adapters, and a 20-foot power cord. Therefore, you don’t have to do any extra research or nothing. But the hose is a little short for my taste. I’d prefer something around 20 or 30 feet personally. Since it all comes together though, I’d make do with what they gave me. It’s just easier that way. However, there’s a catch with this pump; this vast amount of convenience costs a truckload. In this case, I think wouldn’t mind as much as I would with a different product. To be honest, this pump easily moves to the top of my list based on its overall convenience and quality. Our second Clean Dump product, the Clean Dump Permanently Macerator Pump, sounds a lot like our first one; however, there’s one significant difference, this one is a permanent RV macerator pump rather than portable one. But this change doesn’t make the overall product worse; In fact, I’d argue Clean Dump does an incredible job keeping the same quality from product to product. And this pump is no different. For example, just like the portable version, this pump can pump across long distances up to 150 feet. Therefore, giving you some flexibility about where you dump your RV waste. Again, this feeling of flexibility is something I love because that’s means I’m not tied down to one location regarding dumping my RV waste. The long distance gives more options, and I can choose where I feel will be the best dumping ground. Of course, I’m never going to buy this product because it doesn’t fit my portable needs. But if I did want a permanent RV macerator pump and money was no object, this would definitely be my choice. See, it has everything I love about the portable version, and the installation has proven to be extremely simple. If you don’t believe me, the customer reviews will change your mind. It crazy how many people commented about how the installation of this pump was so easy. As someone who doesn’t have the best track record with these types of things, these reviews surely eased my mind. But regardless of how much I love this product, I don’t think I’d be able to afford the price even if I needed a permanent RV macerator pump. The price is just too outrageous and almost double what I’m looking to spend. Even the portable one was outside my price range, and this one is significantly more expensive. The Flojet GPM Macerator Pump is a permanent RV macerator pump that any RV owner would benefit from having in their life. Honestly, this product being high quality isn’t a surprise, given its manufacturer. Besides coming from a first-rate macerator pump manufacturer, it has many different features that I love. For example, the built-in impeller protection device was the first thing that stood out to me. With this feature, the changes will increase that your impeller never becomes damaged or needs to be replaced. 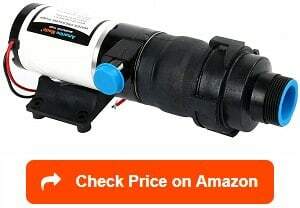 And since I don’t want to be buying another whole macerator pump or replacing a part of one any time soon, this feature could save both you and me a bundle. Other than saving people money, this permanent RV macerator pump handles both your gray and black tanks to promote extreme efficient. 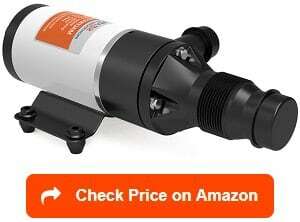 In any estimation, this pump will effectively clean out both your tanks without issue. And given this Flojet macerator pump reviews; I can see this claim is valid. Being someone who values a company keeping its word, it would give me more confidence in purchasing this product. But alas, it’s a permanent RV macerator pump, so, it just doesn’t fit what I’m looking for in a macerator pump. Furthermore, the fact several customers say this pump actives its thermal protection a little too frequently is another cause for concern. I mean, I don’t want to be continually switching this on with its proclivity of overheating. Honestly, if this issue the signification problem it seems to be, the whole waste removing process would take forever. Our last two products come from the same company, SEAFLO. And this one, the SEAFLO Macerator Waste Water Pump, has a lot of exciting features. These features make it a compelling product for any RV owner in the market to buy a permanent RV macerator pump. For instance, it has an anti-clogging feature that allows the pump to dislodge clogs without removing the hoses. With this feature, the owner of this pump would have to worry about all the effort of dealing with clogs. Instead, the pump would deal with the clogs for them. It’s a unique, beneficial feature that immediately ensures this pump will stand out from the pack. And this feature isn’t the only one that makes this pump a solid contender for any RV owner. See, it also has a triple sealed motor, which will help prevent against internal or exterior damage. Again, anything that will help me avoid having to buy another one of these in a couple of months/years is a welcomed feature. Another welcomed feature is the four blade chopping design, which helps reduces clogs and exceptionally quickens the whole dumping process. It seems like SEAFLO is trying to accelerate the process by improving several areas at once. And even with this improvement, the cost remains very affordable. But there is one issue I was continually seeing in the customer reviews; it seems to have problems pumping waste uphill. Now, for me, I wasn’t going to buy this product regardless because it’s not portable, but I could still see how this lack of ability pump of uphill could be a massive issue for some RV owners. It’s definitely something to think about before you purchase. A lot like the model above it, the SEAFLO RV Marine Macerator Pump System is another top-notch permanent RV macerator pump. In fact, it has many of the same features that make the one above it great. See, it has the four blade chopping design, the triple sealed motor, the thermal protection, but what it doesn’t have is the anti-clogging feature. In my opinion, this subtraction is a real bummer. But regardless of the missing anti-clogging feature, there’ still a lot to like about this product such as it’s incredibly efficient at its job; 12 gallons per minute is a pretty impressive flow rate. Additionally, the SEAFLO RV Marine Macerator Pump reviews were praising how easy it was to install was another nice touch. I never understand manufacturers that made their product so difficult to assemble, install, or use; just doesn’t logical sense. Besides those two aspects, there isn’t much else to talk about that I hadn’t covered in the review before this one. This product even has the same affordable price as the other SEAFLO model. But there was one new issue that popped up during my research. Apparently, this pump tends to be very loud when it’s in use. As someone who gets regular migraines, this issue probably wouldn’t go over well with me. All in all, if you were going to buy a SEAFLO product, I’d go with the one before this one. The anti-clogging feature just makes that version a better option, and they cost the same price. I mean, if they cost the same, why would you take a lesser version over a better version with a more essential feature? It makes no logical sense. When you’re looking for an RV macerator pump, there are probably many factors you’re considering in your head. With this in mind, this section will walk through some essential elements that will guide you toward the perfect RV waste macerator pump. What Type of RV Macerator Pump Do You Want? For RV macerator pumps, there are only three types you need to know about: portable RV macerator pumps, permanent RV macerator pumps, and 110V macerator pumps. As you might expect, each one has features that appeal to different RV owners. For example, if you’re RV doesn’t come with an already built in RV macerator, then a portable macerator pump would be an ideal choice for you. 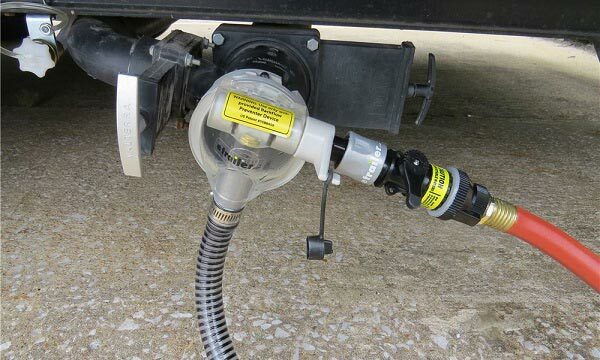 Likewise, if your RV doesn’t have a designated area for a macerator pump installation, these portable RV macerator waste pumps have proven to be a good fit. If your RV does have a designated area, a permanent RV macerator pump would be the pick for you. And you should look for one with a grey water bypass that way you don’t have to run your pump to empty the gray water. And if you think these two types of 12v RV macerator pumps are too time-consuming, a 110V (it might be 115V in some cases) macerator pump would be appropriate for you. However, be warned; these are going to be extremely costly. In the end, I’d probably opt to get a portable RV macerator just because they tend to be the cheapest type. Also, I wouldn’t have to deal with the additional installation; I could just pick it up, plug it into my waste outlet, and watch it work. What Are You Willing to Spend/How Much Are You Going To Use It? Regardless of the RV macerator pump that you choose; it’s going to cost you a bit of money. 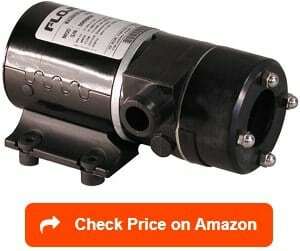 However, the range of these pumps is pretty diverse, and the good ones cost on average around 200- 300 dollars. Expensive right? I know. But for people looking to RV in places where dumping stations aren’t frequently available, this amount of money could end being cost-effective. And of course, there are cheaper options under this average that are just as effective as the 200 dollars ones. But these options tend to last a shorter time, and you could be buying a new one in a couple of years. Overall, it comes down to how many times you’re planning on using your new RV macerator pump. For example, let’s say; you just want it around for emergencies. In this case, I’d tell you to opt for a less expensive version. But as previously stated, if you plan on using all the time, you’re going want to explore those 200-dollar models. Doing so will ensure you’re not back rereading this article in a few years time. I mean, we won’t mind, but your bank account will. 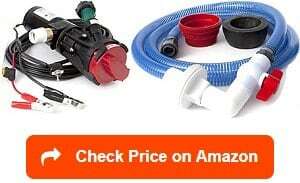 The first additional product you’ll need to buy is a garden hose. Obviously, you’re not going to use your regular garden hose, as waste might get stuck in there. If you do, you’re going to end up spray waste particles all over your RV during the next cleaning. Next, you’ll need to buy a product called a “clear elbow” such as this one to see what’s going on and where the waste is going. And these “clear elbows” do precisely that by connecting one side right to your waste outlet. Then, you connect the other side to your new RV macerator pump. Now, with this connected, you’ll be able to see exactly when your tank’s empty. Yes, it will be gross, but it’s an essential piece to successfully using one of these pumps. See, if you can’t see when the flow of waste stops, the pump might start dry running. And this can be a problematic thing because it could cause the pump to burn out, which would be a very annoying thing to deal with for any RV owner. Thankfully, neither of these two products is that expensive, so, don’t fret too much about having to buy these additional items. It’s not that big, but both are necessary for having a positive RV macerator pump experience. Otherwise, depending on the model, you’ll need to buy fuses, switches, adapters, alligator clips, etc. Honestly, regarding these features, I wouldn’t waste any time and would buy a full kit to ensure I don’t have to do additional research. If you have gone through some of my other buyer reviews, you know how big I’m on reading customer reviews before making a purchase. And it’s no different here. In fact, it might be more essential because nobody wants a malfunction RV macerator pump. I mean, it’s carrying our waste from place to place, and if it malfunctions, I’m not going to explain how gross it can get. Therefore, you better make sure to check out those customers reviews before deciding on the RV macerator pump you end up choosing: especially if you pick one that isn’t in our product review section. In this section, we’ll go over the questions customers regularly ask about RV macerator pumps to ensure you feel comfortable. It’s all to make sure you pick the right RV macerator pump that fits your needs. An RV macerator pump is very similar to a kitchen sink garbage disposal. See, it connects to your waste outlet and grinds up your waste. Then, it pushes the waste through a hose the size of a garden hose into an appropriate waste-containing zone. Mostly, it’s alternative waste remover in times of crisis such as your black and gray waste values not lining up with the RV dump station or your RV’s parked too far from it. In either case, an RV macerator pump would help you dearly. See, with these pumps, you can quickly dump your waste into a holding tank, nearby sewer opening, private septic system, or toilet by grinding the waste into small pieces. In other words, these products exist, so, you don’t have to deal with the awful dumping stations. All in all, it’s just a precaution to give you peace mind about always having some you can dump the waste your RV acclimates. In a sense, you hope you’ll never have to use, but if you do, it’s a lifesaver. How does a macerator pump work? Well, as mentioned in the previous FAQ, an RV macerator pump works much like a kitchen sink garbage disposal does by grinding your waste up into small pieces. Then, passing those small pieces through a garden hose or similarly sized hose. Therefore, these pumps allow you the privilege of not having to use those standard 3” sewer hoses anymore. Instead, the pieces are grounded down small enough that you dump them into a sewer, toilet, or septic tank. In other words, these pumps turn the waste that enters your RV’s into slurry. This slurry then gets pumped through a garden hose into a place with the ability to handle your RV’s waste. And since an electric pump does all the hard work, you can even pump the waste uphill: another advantage to using one of these pumps. Overall, these RV macerator pumps exist to make an RV’s waste more manageable and less of a nuisance for RV owners. What are the types of RV macerator pumps? There are three different types of RV macerator pumps: portable RV macerator pumps, permanent RV macerator pumps, and 110v RV macerator pumps. There are subtle differences in each one that we will go over below. 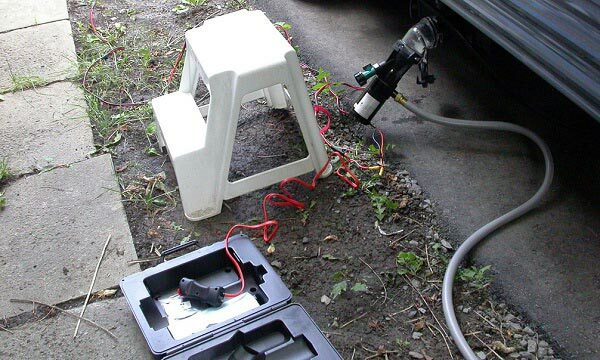 For instance, the portable RV macerator pumps are products that you can move around from place to place. With this feature, you have a certain flexibility and don’t have to worry about installation. In contrast, permanent RV macerator pumps can be stored under your RV on a full-time basis, which some people would prefer over the portable. I’m guessing this preference is due to less of a hassle. In result, the process is supposed to be quickened. But these products are incredibly expensive and only really offer improvement the time the whole process takes; also, they might be a little too powerful for some RVs. Why do you need an RV macerator pump? Just in the case, you need a waste-removing alternative to a dumping station. See, there are specific scenarios where you might not have access to one and need another method. And these pumps offer you that other method. Or you can completely stop using dumping stations altogether with one of these machines. As mentioned above, they grind up the waste into small enough pieces that allow you to dump waste where you’d won’t ordinarily able such as sewers or a toilet. Along the same lines, since these pumps use a smaller hose, they can help mitigate that awful smell coming from your RV’s waste. Honestly, anything that can help lessen the smell would be a positive addition to your RV. Overall, you might not technically need an RV macerator pump, especially if you’re always planning to be around a campground. But they’re nice to have around, especially, if you don’t have dumping station or sewer access. It depends on the model, but usually no. Honestly, it’s pretty rare to see a macerator pump manufacturer include a hose with a purchase. It’s probably because the manufacturer assumes you have some hose lying around. After all, the whole point of this product is making your RV’s waste smaller; so, it can fit through a garden hose. Of course, you’ll want to make sure you don’t use the hose you use to wash your RV. Waste residue could get left behind, and that’s just nasty. So, go out and buy a second garden hose to make sure this process goes swimmingly. How to use RV macerator pump? Pull the drain valve on your tank. Other than the standard dumping process, they’re certain tips you can use to make the process go smoother. In this article, under the additional lessons learned section, you’ll see some useful tips about the overall use of an RV macerator pump. Now, it’s time you decide on whether or not you’re buying one. If you do choose to buy one, you should have enough knowledge for an informed decision about which is the best RV macerator pump. And once you make that decision, you should put it right into your Amazon cart. Honestly, one of these products will make your RV life a whole lot easier. After all, why do you think newer RV’s already have them built-in? So, join the pack and get your own RV macerator pump. It will just make your life a lot less stressful. And isn’t that the whole point of RVing anyway: to get away from the stress city/suburban life provides. We would like to thank you for reading this article. Find out more about how to choose the best RV holding tank treatments, best RV toilet papers and best RV toilets with our reviews and ratings. 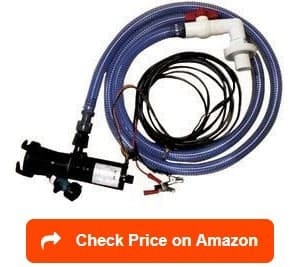 Furthermore, please take a look at the best RV sewer hoses and best RV portable waste tank reviews to choose the best one for your RV waste water and sanitation. You can order from Amazon and they will ship the product to your country.